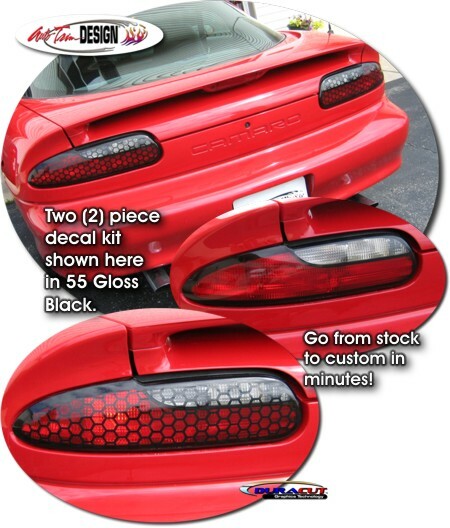 Enhance the look of your '93-'02 Chevrolet Camaro's factory tail lights with our unique enhancement decal kit. Designed with a honeycomb pattern, decals are manufactured with additional vinyl material at the edge for trimming after application. Decal set comes with two (2) pieces (one for each side). Available in a wide variety of colors, kit includes easy-to-follow general online instructions. Note: Some colors may be translucent when lights are on. If you desire a "solid" look with no light shining through, we recommend installing an opaque color such as Black (shown).